Detail of one of Brük Dunbar's cacti. A few years ago, when East Bay ceramic sculptor Brük Dunbar was on a trip with her mother through her homeland, deep in the badlands of New Mexico near El Malpais National Monument, she encountered a sheepherder. "This guy was totally off the grid — well, there is no grid out there," Dunbar recalled. "We met him standing under a sign that read, 'I'm an attorney. Were you a miner in the 1960s? I can help you.' The whole place is ruined by uranium mining!" Dunbar was so moved to learn of how uranium mining poisoned the land and the people that she immediately came home to Berkeley and began work on what would become pieces for her new show, Malpais: the Badlands, opening this week at Zughaus Gallery (1306 Third St., Berkeley). Although the work may seem reactionary, Dunbar has a history of thoughtful meditation on environmental disaster. In 2005, as she earned her bachelor in fine arts from California College of the Arts, she presented an art installation of houses propped up on water pipes, addressing water rights in her native New Mexico. In 2006, she built an installation of flooded houses at Basement Gallery in Oakland, monumentalizing the plight of those affected by Hurricane Katrina. Most recently, in 2010, at Zughaus Gallery, she built a memorial to the Deepwater Horizon oil spill in the Gulf of Mexico, constructing a massive, thirty-foot chain of tires that became sequentially smaller until the smallest one was no larger than a thumb. When asked about the ongoing ecological theme of her work, Dunbar responded, "I am fine with being an ecological disaster artist. It is the most interesting stuff out there." 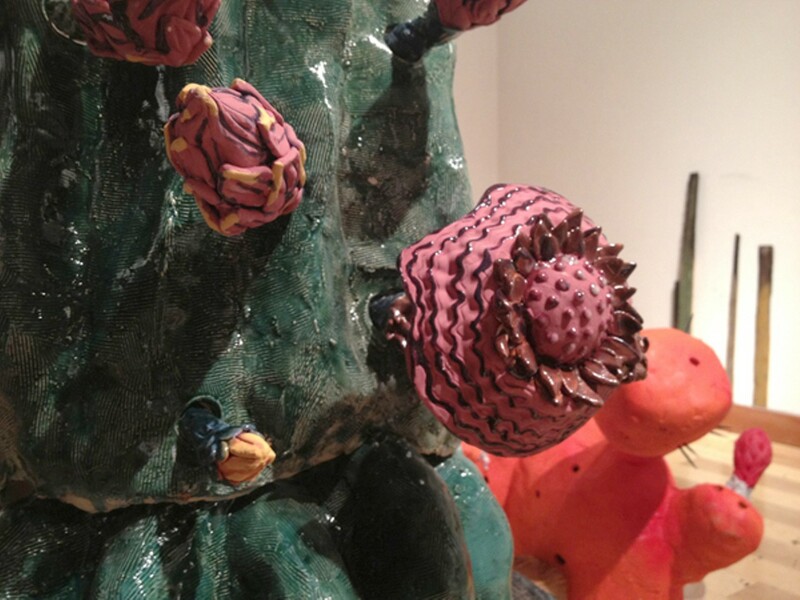 Dunbar's new show may be her greatest effort yet: a series of floor-to-ceiling-size ceramic cacti that warn of the future, with specific regard to our amnesia about our recent collective crimes against nature. Papier-mâché mushroom clouds crowning each cactus punctuate the warnings. But why use ceramics to address uranium? Dunbar explains: "Did you know that ceramics and uranium were united in 20th-century functional art? Fiestaware used to sell uranium-glazed bowls to the marketplace." Dunbar's ability to avoid indulging in political agenda and instead present a beautiful show with substance and backstory makes this exhibit well worth your time. The exhibit at Bedford Gallery is made entirely of cardboard and includes a 25-foot racetrack.